In Mustang, the monsoon is almost over. As the clouds lift to reveal blindingly blue skies, visitors get ready to enjoy the biggest festival in Nepal’s trans-Himalayan region: Yartung. But it is here in Mustang that the festival is celebrated with most passion, a fervour that wasn’t dampened this year even by the prolonged closure of Jomsom airport. “Yartung is one big party,” explains Amchi Gyatso Bista, chairman and co-founder of Lo Kunphen medical school in Lo Manthang. “The rains are gone and after months of toiling in the fields, the land is ready for harvest, it’s the perfect time for celebration." Festivities first start in Lo Manthang, where everyone from the royal family to monks and villagers gather at the centre of the walled town with their horses. The procession then advances to an open field on the outskirts, where tents ruffle in the afternoon breeze. Like every year, there are tourists jostling to capture the moment in their cameras. After a fair amount of drinking, men and women perform the traditional shebru dance, but by far the most popular event is the horse race. Daylight finally fades and the procession heads back to town. Yartung is a travelling festival and it is held in Khimkar near Muktinath two days later, followed by Jharkot and Ranipauwa. The procession from Jharkot village is headed by the heir to its ancient royal family of Mustang. One man from each family heads to Muktinath temple on horseback and the procession eventually congregates at Ranipauwa, the tourist hub. Eating, drinking, and merry-making culminate in different competitions involving horses. 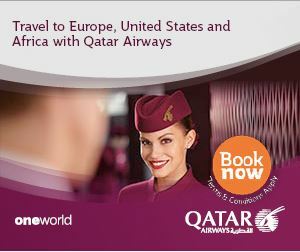 There are races and events requiring riders on horseback to pick up scarves with money inside. 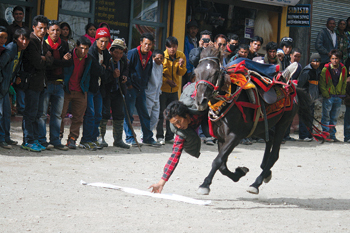 The biggest and the final competition involves an uphill horse race from Khimkhar to Ranipauwa and attracts competitors from as far as Manang and even the Nepal Army, and it brings to close this magnificent festival. 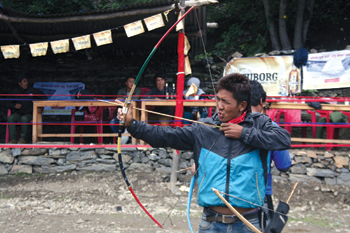 Football and archery competitions are also held between the villages. 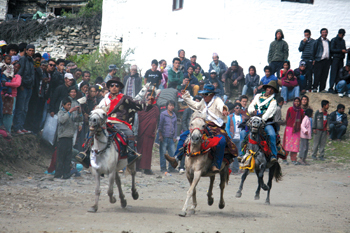 Yartung attracts visitors from all over and many Mustangis from Kathmandu and abroad travel home for the festival. Lodges are fully packed throughout Mustang during this period. 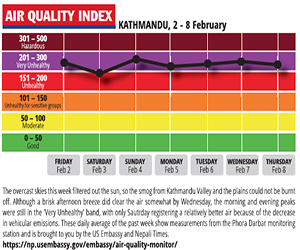 “Tourists from Pokhara and Kathmandu have been calling for a week to book rooms,” says Tsering Gurung, a hotel-owner. This culturally and economically important festival almost died out some years ago, it is to the credit of Mustang’s youth that it was revived.